In today’s class, we started on what the objective in running a business should be. While corporate finance states it to be maximizing firm value, it is often practiced as maximizing stock price. To make the world safe for stock price maximization, we do have to make key assumptions: that managers act in the best interests of stockholders, that lenders are fully protected, that information flows to rational investors and that there are no social costs. 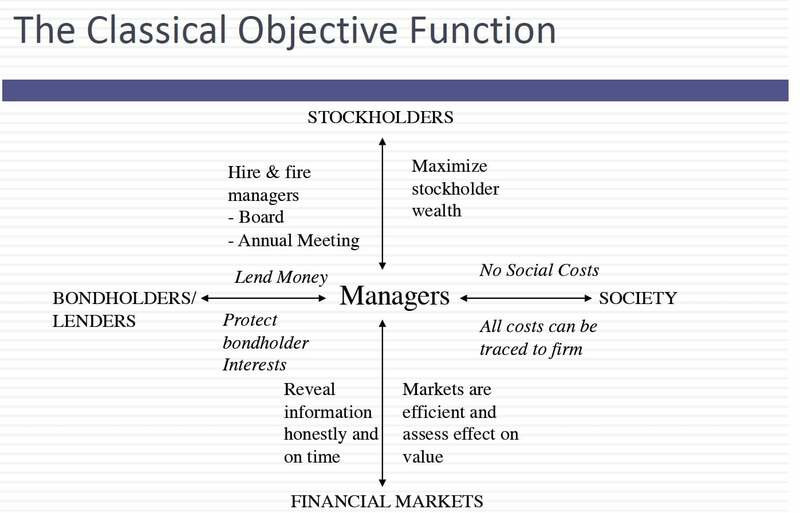 We started on why one of these assumptions, that stockholders have power over managers, fails and we will continue ripping the Utopian world apart next class. There are a couple of things on the syllabus that I did not get to that relate to the thing that. Hangs over all of your heads which is grating. Can you hear me. And I didn't mention how I was going to grade you. And first if you're here for an easy grade I would suggest switching sections because you know all the corporate finance classes are covered by pretty much the same grade distribution. It's about 30 to 35 percent A's about 55 percent B's and 10 percent C's, D's, etc. You can fail a class as an MBA but you really have to try. I'd like everybody to get ace. I mean any. I actually view a B on your part as a failure on my part. So it's kind of a it's but with a class that size 5 percent CS is still a lot of Cs. So let me lay out what I would try to do to make it at least transparent view as to how to get a good grade. 60 percent of the grade in this class comes from quizzes and exams. There be three quizzes and the data the quizzes are on your calendar so you put them down. The first 30 minutes of class. Now if you look around you you already can see that taking a quiz. In this room with all of you here is a nightmare. It says people are bumping into each other. So on the quiz dates I've actually got two other rooms and what has happened is about 150 of you will leave this room into one of those two other rooms and I'll tell you before the quiz. Obviously this is not random seed. So you'll have more room for the quest. 30 minutes to open book opening notes. Open calculators open open iPad's no open laptops yakked and if I ever became open laptop that you'd be terrified about the kinds of quizzes I can give you a but the open book open notes I've to be quite on as is a delusion. Because with 30 minutes if you keep opening your book and opening your notes there will be 30 minutes of your time so you still have to be well prepared but it does mean I will test you on equations in your room. I didn't care about because you can always look up an equation it's really about applying what we learned in this class. So three quizzes 10 percent each. And a final exam which I think is scheduled for the 17th and the Friday right at the end of it so it's before the weekend so you can get done with it sooner rather than later which is 30 percent non-content you can miss her quiz. But that's silly. I mean you will miss quizzes. Why because life gets in the way you're going to get sick your spouse gets sick your dog gets sick. I've tried her for an interview so I understand you. So if you missed the quiz here's what will happen. That 10 percent from that quiz will be moved to whatever's left in terms of exams for the rest of the class. Let me be clear. So if you miss the first quiz at 10 percent right. I moved that 10 percent to the second quiz the third was in the finals of the second cousin and I'll become 12 and a half the third would become 12 and have the final become 35. If you missed the second quiz the 10 percent will get moved to the third quiz and the final if you missed the third quiz we'll all be moved to the final. Sounds like a convoluted way to do it right. You know what I'm trying to stop. Strategic quiz missing what is that. Well if you do really well in the first two quizzes one very simple way to increase the weight on the quiz. If I'm not careful is to miss that third day Look I missed the third quiz the first two quizzes are worth more so I've be doing this a long time. So whatever trick you have in mind I've already thought about that. So in this case that was so missing quizzes not the end of the world. I'd like you to miss quizzes only for good reasons. And I've learned in this class that whatever I say I have to be explicit about. So if you go to your syllabus I've listed are good reasons but I also be open about the fact that if you give me a good reason I would trust you. So if you tell me the subway broke down I'm not going to go to the MTA website and check to see whether the subway broke down I would just say OK. So really I'm going to give you a pass if you want to miss a quiz. But here is why I think you should take all three quizzes if you take all three quizzes CEOs the bonus you get. I would take only two best quizzes and drop the third one. So basically I weighed the two quizzes that were better quizzes which means if you get to the first question you're not quite ready. I would still take it because what's the worst that can happen you get a zero. And if the deal was was amended don't knock it out. So it's better to take a quiz then dismiss it.